The Great North Wall Railway Robbery of 1915. Shortly after midnight, in the early hours of the 15th August 1915 a small group of 6 men made their way into the London and North Western Railway Depot at the North Wall. Armed and masked they quickly overpowered the four night-watchmen and made their way to a warehouse near Spencer Dock. It was soon obvious to the watchmen that they were well informed and knew exactly what they were looking for as they re-appeared from the warehouse with a number of large wooden cases. They dragged these along the railway track towards a wall to the side of the depot where a number of motor cars were waiting for them. It had been quick and audacious and within minutes over 100 rifles belonging to the Irish National Volunteers were speeding their way to a destination unknown. The weapons were Martin – Enfield .303 rifles and were intended for John Redmond’s National Volunteers. 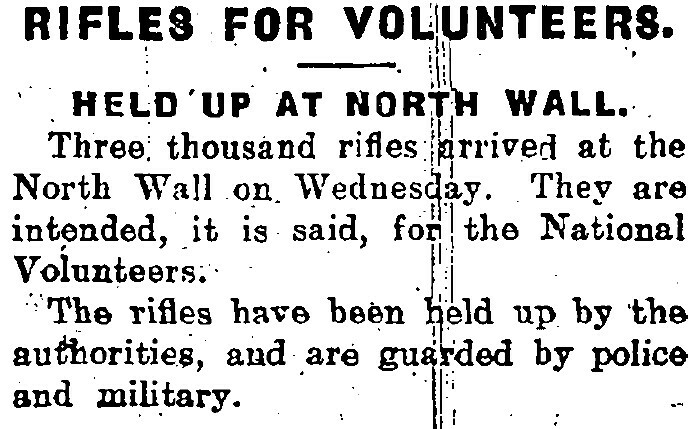 Since the now famous landing of rifles at Howth on the 26th July 1914 the Irish National Volunteers had legally imported regular consignments of rifles through the North Wall. Most notable was a consignment of 3,600 acquired from the Birmingham Company H. Trulock Harris & Co, with bayonets and 50,000 rounds of ammunition in August that year. Those had been confiscated and the London and North Western Railway had refused to carry further weapons for the National Volunteers and it took a combination of John Redmond’s close friendship with Henry Givens Burgess, the LNWR’s Manager and political intervention at the highest level to get the railway company to transport further consignments. 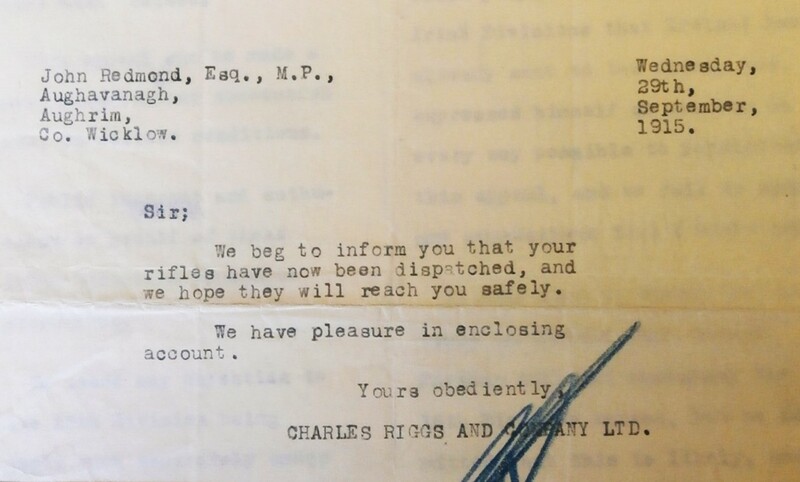 Throughout 1915 regular cargoes of up to 100 rifles were imported from Charles Riggs, a London based arms dealer without any problems other than the somewhat ham-fisted approach by the National Volunteers to obtaining import licenses. On the 14th May 1915 Matthew Nathan, the Chief Under Secretary at Dublin Castle had warned Redmond that the Volunteers showed “little administrative capacity in the matter of importing rifle for their use.” He went on to note that Laurence Kettle ( a founding member of the Irish Volunteers) had a permit issued for 350 rifles which he hadn’t used, yet in order to import a consignment of 100 rifles they had involved The Prime Minister, The Under-Secretary of State for War, The Master General of the Ordinance, The Chief Secretary for Ireland, and The General Officer Commanding-in-Chief of the Forces in Ireland. Nathan pointed out how impractical that was and that it could be simplified with permits issued at both ends by the relevant military commanders. (Kettle’s rifles were a special consignment of Martini- Metford.303 rifles then being made up for the National Volunteers by Webley & Richards, and Hollis, Bentley, &Playfair). However it seems the paperwork continued to be a problem with rifles often sitting for long periods of time in storage until cleared by the authorities. 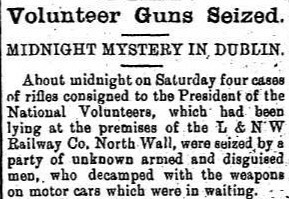 This was still the situation in early August 1915 when a consignment intended for the Limerick Volunteers arrived at the North Wall on the 3rd but remained in storage while Customs cleared the authorisation to release them. The Irish Volunteers were founded in 1913, with the stated aim to ‘to secure and maintain the common rights and liberties of Irishmen’.With the outbreak of the European War in 1914 the issue of recruitment to the British Army led to a split in the Volunteers . John Redmond (MP and leader of the Irish Parliamentary Party) had called on the movement to support the British War effort, with the belief that Home Rule for Ireland would be secured once the conflict ended. 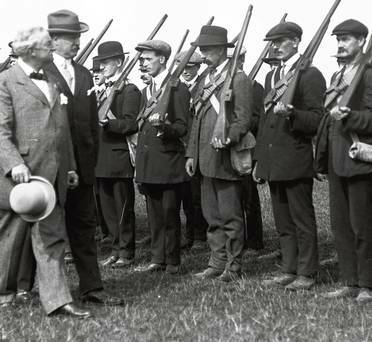 The majority stood loyal to John Redmond and became known as the National Volunteers. A small group of about 10,000 remained as the Irish Volunteers. (It was from this group that a majority of those who took part in the 1916 Rising would come). While this group retained locations such as Father Matthew Park in Fairview, the majority group which followed John Redmond retained the organisations finances and the capacity to import weapons legally. The Inspector General of the National Volunteers was retired soldiers named Colonel Maurice Moore who seems to have had an uncanny ability to clash with and annoy most groups he came into contact with, including his own. Relations between the British Command in Ireland and Moore were poor. Moore claimed that they had conspired to prevent him rejoining his regiment on the outbreak of the war. 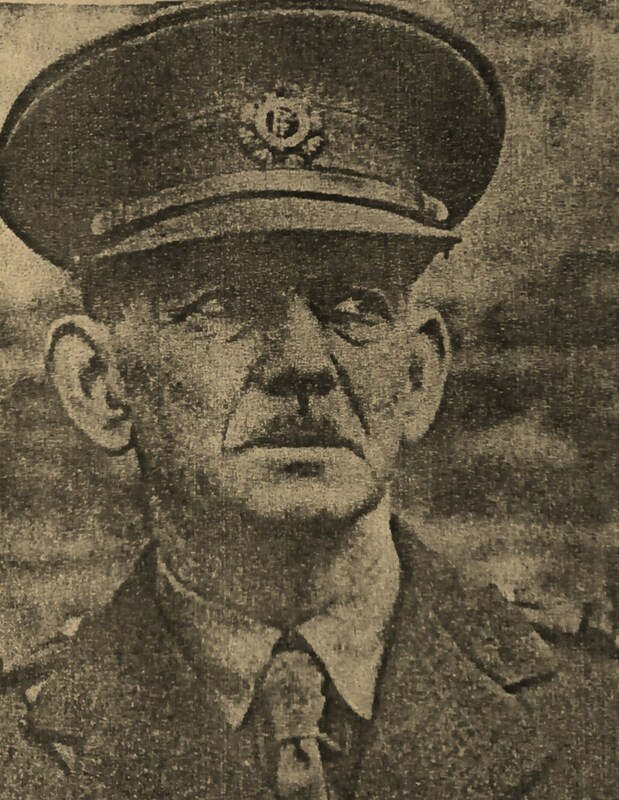 Augustine Birrel, the Chief Secretary, said he had “old military grievances”, while General Friend, OC Ireland, described him as “a disappointed man” and like others at Army Command questioned his motives with the National Volunteers. Among the Dublin Castle Administration resentment developed over the Irish Parliamentary Party using their political influence to push forward the importation of arms and tying them up in endless paperwork as they were busy preparing the 16th Irish Division for Gallipoli. They also felt that security around the arms being imported was poor and that many of them would fall into the more extreme hands of the Irish Volunteers (or “Sinn Fein” Volunteers as the authorities now called them). The net result was that they began to drag their heels in dealing with import licenses for arms and this was the case with the rifles which arrived on the 3rd August 1915 at the North Wall. The consignment had originally been ordered in May following an appeal to John Redmond from The Limerick National Volunteers for weapons as the regiment’s enthusiasm was waning. They felt that a show of rifles on the parade ground would reinvigorate them and increase their membership which had begun to decline. 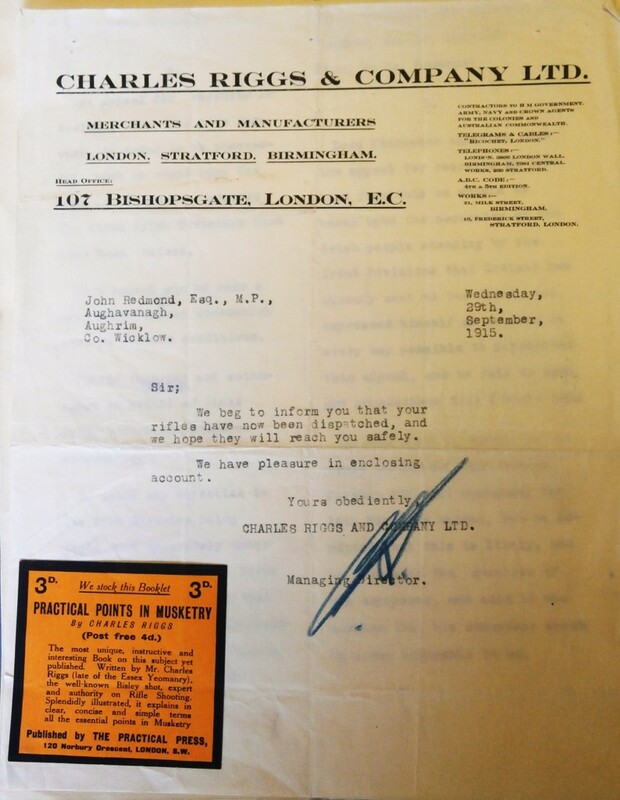 However the authorities had been reluctant to pass the import license as Laurence Kettle still had an outstanding one for 350 rifles. After much delay the weapons finally arrived at Dublin at the start of August. Customs added further delays and it was only on the 12th that notification of their release was given to the National Volunteers. Exact details of what happened next are unclear but having been informed the National Volunteers delayed collecting the weapons as they were unable to organise transport .It appears their release became known to another party with a particular interest in this cargo. The following afternoon a man claiming to represent the INV HQ made inquiries about the consignment and then left. Later that evening the raid took place. It was highly embarrassing and a number of senior DMP officers were put on the case. The LNWR began its own inquiry headed up by their Chief of Railway Police, William Ainslow, to see if it was an inside job but turned up nothing. On the 21st August John Redmond met Matthew Nathan (the Under-Secretary for Ireland) and accused the authorities of facilitating the theft through a combination of unnecessary delays and police inefficiencies. Colonel Moore of the Volunteers decided to instigate his own inquiry by bringing in a friend who had served with Scotland Yard. Much to the annoyance of the authorities began making unsubstantiated allegation. In particular he accused DMP Chief Superintendent George Lowe of being opposed to the National Volunteers and impeding the investigation. It was politely pointed out to him that that gentleman had retired from the force nearly six months and could exert little influence on the case. 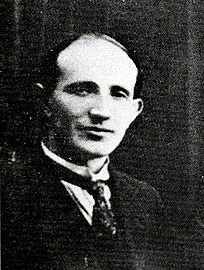 Moore then turned his sights towards the Irish Citizen Army (ICA) who he claimed were the one organisation in Dublin with the capacity to bring off such a daring raid. He claimed they controlled all the men working on the docks and the railways which gave them a special capacity to bring off such an audacious stunt. There was little love lost between Moore and the ICA from the time of the Howth Gunrunning when he felt they had disrespected and humiliated him as he attempted to recover mauser rifles landed at Howth which had been “acquired” by the ICA and taken to Croydon Park in Fairview. 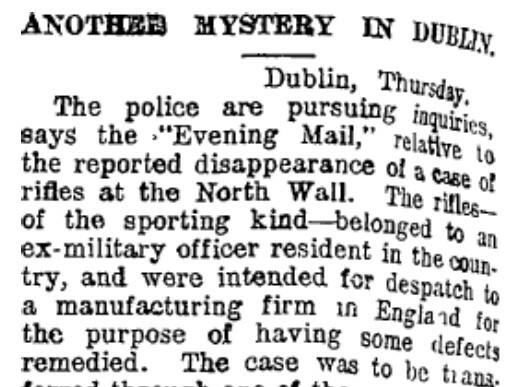 By 1915 the ICA had completely fallen off the radar of the RIC in County Dublin and even in the city the DMP saw them as little more than an annoyance. Moore demanded that the authorities immediately raid Liberty Hall and Croydon Park and while the military were prepared to attempt it, Matthew Nathan refused to sanction it because of the potential fallout. The ICA were put under surveillance but by September there was little to report other than the acquisition of a few new shotguns. A war of words continued between Moore and the administration at Dublin Castle. Even more embarrassing a second raid took place at the LNWR in September in which a case of weapons of various types destined for the repair shop of a London gun manufacturer were taken. Like the first raid no one was ever charged and the weapons never recovered. Finally in October, Nathan told Colonel Moore that the case was closed and that no further investigations would be sanctioned. That may have been factually correct but a recently released DMP report from the 13th August 1915 records that a group of “Sinn Fein” Volunteers assembled at Parnell Square and route marched to Father Mathew Park on the evening of the 12th. It was probably within this group that the idea of stealing the rifles developed. Peter Martin may have been among them or met them at the park. He was a member of E Company, 2nd Battalion, and their inside man working at the LNWR at the North Wall. The information became known to Mick McDonnell of the same company, later to command Michael Collins Squad, and it was McDonnell who quickly drew up the plan and put it in place. A number of others from E and F Company, both based at Father Mathew Park, who either worked or lived in the vicinity of the LNWR were drawn into the plot along with the two Franks – Frank McCabe and Frank Daly. The latter brought in most likely due to his knowledge of explosives. Ultimately these would not be needed.The final piece of the plan was put in place by bringing in Joseph Dunne, a driver with Thompsons, to organise the transport. In the end the robbery was straight forward with the cases of rifles accessed relatively easily. Although notice had been short the accuracy of Peter Martin’s intelligence coupled with the precision of McDonnell’s plan meant the raid was successfully over in minutes. Soon much of the cargo was speeding towards Father Matthew Park , where they were briefly stored before being transferred to the Saucerstown Farm of Frank Lawless, a senior figure with the Swords Volunteer Company. During the 1916 Rising he would be second-in-command at the Battle of Ashbourne. In all probability many of these rifles saw action there. In the overall scheme of things the North Wall Railway Robbery was minor, nonetheless that shouldn’t undermine its significance. As the National Volunteers huffed and puffed their way around the fields and bye-ways of Ireland, there were young men and women who were prepared to take the next step in advancing independence. Such a group was the LNWR six in what was one of the first offensive military actions in the run up to the Rising. Coming so soon after the O’Donovan Rossa Funeral it must have been a major morale booster for the resource hungry Irish Volunteers. It is to the credit of those who participated and the small group of their colleagues aware of the raid that it has taken 100 years before anyone could publically reveal their identities. McDonnell joined E Company, 2nd Battalion, shortly after the landing of the rifles at Howth and this was his first major raid. He later fought at Jacob’s Factory during 1916 and was interned at Frongoch. 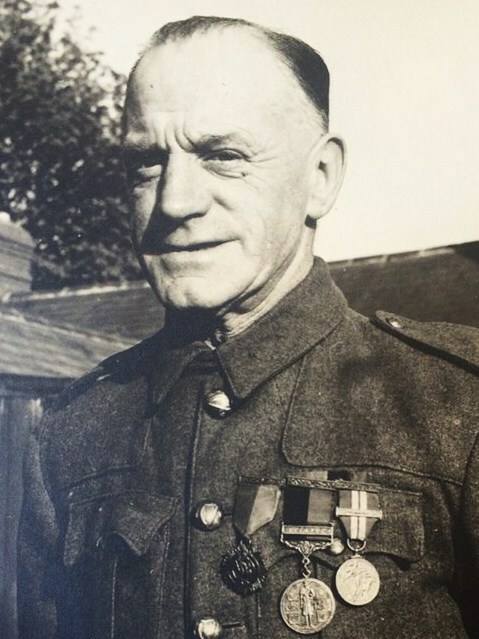 During the reorganization of the Dublin Brigade he became Quartermaster of the 2nd Battalion and commander of the Active Service Unit better known as The Squad. It was McDonnell who drew up the plan for the raid at the North Wall which was something of a coup at the time and showed the leadership skills which would prove so vital in the years to come. He was described as one of the most active volunteers during the War of Independence and took part in every job of any consequence during that period. Sent to New York in 1921 by Michael Collins, he remained in the USA after Independence. Martin lived at 38 Common Street North Wall and was a member of E Company, 2nd Battalion. He worked at the LNWR and was the man on the inside who provided the intelligence which made the job such a success. He fought at Jacob’s in 1916. Martin died of natural causes in 1922. 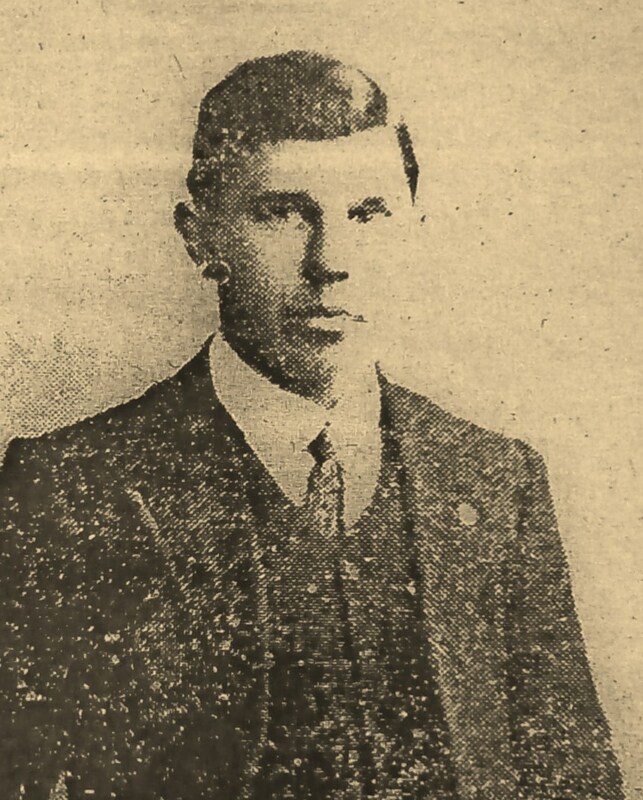 From 9 Leinster Avenue, North Strand, Murphy was a member of E Company, 2nd Battalion, and had taken part in the Howth Gunrunning episode in 1913. In the run up to the Rising he worked at the bomb factory at Cluny and it may have been this connection which brought Frank Daly into the group which raided the LNWR. Murphy worked in Lenihans Hardware Store in Capel Street which gave him access to much of the equipment which would have been needed to bring the job off. He took part in the raid on the Magazine Fort and later fought at both Stephens Green and the Four Courts during the Rising. On release he continued to work at making munitions as well as participating in numerous raids during the period. He died in 1953. Weafer was from Wexford and worked for Lipton’s Tea Company on Castleforbes Road, North Wall. His brother Thomas was Captain of F Company, and to many the effective day to day commander of the 2nd Battalion. Both he and his brother were involved in procuring arms in the run up to the Rising which they distributed from their flat on the North Circular Road. Weafer fought at Annesley Bridge and the GPO during the Rising. (Thomas was shot and killed during Easter Week, and is commemorated by a plaque at Lower Abbey Street). He later went to sea and acted as a courier for the Republican movement between Ireland and the USA. He took part in a number of raids including the burning of the Income Tax Office on Bachelors Walk. He was arrested and Jailed at Arbour Hill in 1920. Weafer died in 1946. McCabe was a member of F Company, 2nd Battalion, and took part in both the Howth and Kilcool Gunrunning episodes. He fought at Church Street and North King Street during the Rising. On the reorganization of the Volunteers he was appointed Captain of F Company. Arrested in 1917 he was deported to Oxford until 1920 after which he emigrated to the USA. B Company, 1st Battalion, Daly took part in both the Howth and Kilcool Gunrunning and worked at demolition and quarry work. It was probably his explosives skill which saw him brought into the team although none were needed in the end. From November 1915 he was in charge of the production of hand grenades at Cluny at Clontarf and had a roving brief during the Rising fighting from Ashbourne, through the canals, the GPO, and other locations. Following the reorganizing of the Volunteers after the Rising he served as Captain in four of the 1st Battalion’s Companies as well as taking part in numerous raids and engagements throughout the War of Independence. He also acted as instructor in explosives to the Fianna and many companies of the Dublin Brigade. He died in 1976. B Company, 1st Battalion. In 1915 Dunne was that great rarity, a man with access to a car and an ability to drive it. He worked for Thompson’s Motors in Pearse Street, then one of the largest hire car companies in the city. His driving skills had first came to attention at both the Howth and Kilcooley Gunrunning episodes. 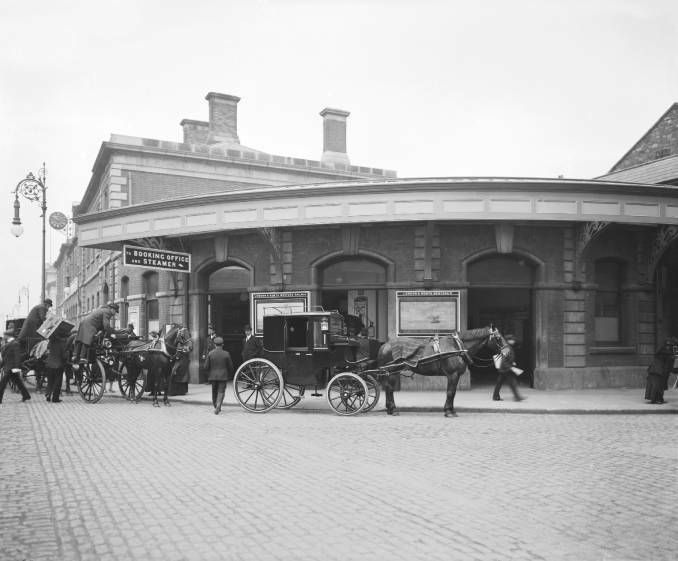 Dunne organized the transport for the raid and took his consignment to a number of locations, the first being his fathers furniture Shop at 13-14 Liffey Street. Others were taken to the home of Seamus Hughes, a future Secretary of the ITGWU and Quartermaster of E Company, 2nd Battalion, at Botanic Avenue. Dunne subsequently set up arms dumps at both his own home at Liffey Street and that of his aunt who lived nearby to conceal the rifles. 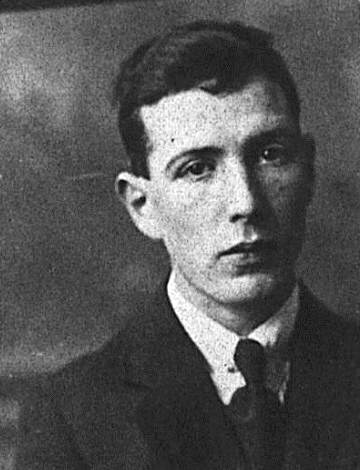 Dunne took dispatches to Wexford in the run up to the Rising and fought at the GPO during 1916 and was interned at Stafford and Frongoch. He later acted as Michael Collins driver. The majority of Images sourced by Hugo McGuinness , with a very special thanks to Jimmy Wren , whose assistance was as invaluable as ever. Thanks to Chris O’Donnchadha for information about his Great Grandfather Joseph Dunne .